'B-P' joined the 13th Hussars in 1876 as a 2nd lieutenant. He was excused the Sandhurst course because of his high placing in the exam and gazetted straight into the regiment, then stationed in India. From the start he showed an aptitude for and enjoyment of military scouting and irregular warfare. He also developed an aptitude for pig-sticking, winning the inter-regimental cup in 1883. He was detached for scouting service in Africa, in the Ashanti (1895) and Matabele (1896) campaigns. 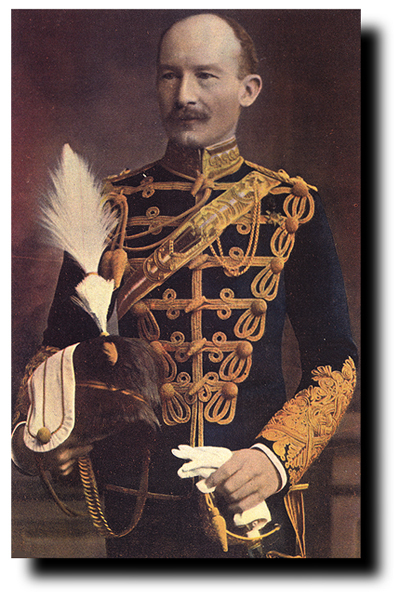 In 1897 he transferred to the 5th Dragoon Guards which he Commanded. While he was on leave in England in 1899 he was summarily appointed to raise a force of mounted rifles to be based in Mafeking with the secret aim of making raids on the Boers in Transvaal. Baden-Powell was a publicity-seeking man and his hour had come. Mafeking was beseiged by a superior force of Boers on October 12th 1899 which lasted for 217 days until May 17th 1900. The relief of Mafeking was celebrated throughout the Empire as it was the first victory the British had achieved in the Boer War. But was Baden-Powell (he pronounced his name 'Poel') deserving of his hero status? He was certainly inovative, resourceful and cool under stress, but he had his failures. Nowadays, one hundred years after the event, what we find most unforgivable was his treatment of the black population of Mafeking. It was an unstated agreement between Boers and British that no blacks were to be involved in the war. B-P took the unprecedented step of arming 300 Africans (with rather antiquated weapons), and christened them the 'Black Watch' setting them out to guard part of the perimeter. As it happened, they proved invaluable. What was infinitely worse, was his forced expulsions of blacks. On one occasion, 700 Baralong women were persuaded to attempt a mass exodus. Only 10 got away, the rest returned, many having been stripped and flogged by the Boers. B-P was appointed Colonel of the 13th in 1911. He remained as such through the amalgamation with the 18th Hussars.